In our latest Beauty Blogger Spotlight feature, we’ll be talking with our fave beauty and fashion bloggers about some of their most coveted and repurchased beauty products of all time. But right now, we’re chatting with Julia DiNardo of the Fashion Pulse Daily before she heads out to NYFW later this week. Make sure to follow Julia on Instagram, Twitter, Facebook and her blog to catch all the NYFW Spring/Summer 2015 trends! Want to know what fashion bloggers rely on to get through a grueling NYFW? Julia DiNardo of the Fashion Pulse Daily, a fashion blog with a strong fashion accessories and beauty focus, dishes on some of her must-have products she can’t live without. 1. 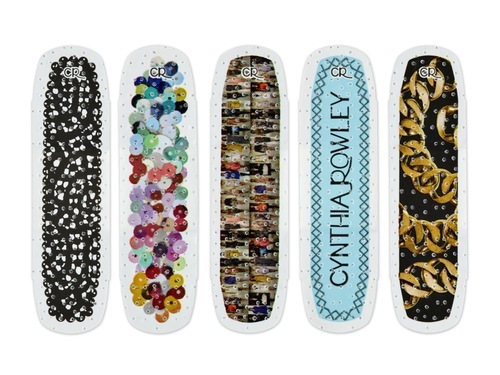 Cynthia Rowley Band-Aids: It’s guaranteed that I’m going to get blisters from all of the running around that I do, so having a steady stream of Band-Aids entering my bag is a must. Plus, these are stylishly decorated; perfect for NYFW! 2. Carmex Moisturizing Lip Balm Sunscreen SPF 15: I’ve been obsessed with Carmex for 23 years (I’m not kidding! ), so having this go-to in my bag takes nary a second thought. Although I’m a fan of the classic jar and original formula, a little SPF is always a good thing. 3/4. Leading off of the Band-Aids, my feet tend to be SUPER unhappy with me during fashion week. So, I’m very much looking forward to using Essie‘s NEW! Spa Pedicure Swept Off My Feet Leg & Foot Massage Oil at night, locked in with my favorite Eco Tools Spa Moisture Socks. The formula is ultra-soothing, nourishing and moisturizing. I’ve got to get my feet to forgive me so that I can put them back into heels the next day! 5. NARS Nail Polish: The reformulation of NARS‘ nail polish is a game-changer. The long-lasting, high-gloss formula and thicker brush help me slick on polish in no time, which is great since I’m always running a steady 10-15 minutes late for everything during fashion week! Lately, I’ve been digging the shades Gold Viper from the 3.1 Phillip Lim collaboration and Thasos. 6. Oille Natural Room + Linen Spray: When time gets tough, I get a-spraying! The Oille Natural Lavender + Cedarwood is heavenly; both calming and sensual, it sets the tone for dedicated writing and focus when I’ve been going on five hours of sleep all week. What do you beauties think of Julia’s calming and fashionable beauty picks for NYFW? Previous Review: BeautyStat.com’s Top 10 Best Healthy, Organic Snack Picks For Back-To-School, New York Fashion Week!